I don't know if this will work on the newer trucks but it worked on my 08. I like to carry my trailer hitch ball mount with me but I don't like bashing my shin on it every time I walk around the back of my truck. I also don't want it floating around in the cab or bed of my truck and it takes up too much valuable toolbox space that could be used for other gear. I saw this picture for a "Stor-A-Hitch" on the internet and it got me thinking. I started thinking about the possibility of storing it under the truck somewhere so it would be completely out of the way but easy to access. After spending way too much time thinking and looking, this is what I came up with. Then I installed it here on my factory receiver. I had to beat it into place with a dead blow hammer. That sucker is in there so tight, it ain't never coming out without a blue tip wrench. It's not loose and it doesn't rattle. Next I had to drill thru the entire assembly including my ball mount so everything would line up. I decided to drill it the same size as the hole that was already in the receiver, but I probably could have gone with a smaller 1/4" hole. I purchased a Master Lock keyed alike trailer pin set and I put a piece of clear plastic hose over the small pin to stop any rattling and compensate for the difference in size. It droops a tiny bit, but it's out of my way and easy to get to. The average person won't even notice that it's under there and I don't think it will hinder my departure angle. I don't think this has weakened my hitch system any because there was already a hole in the factory receiver and the hole I drilled in the ball mount is behind the standard pin hole and on a different plane. So far I'm happy with it! Now thats thinkin lincoln, good job! Thats a cool idea, since my trucks have drop hitches i just always turned them upside down and stuck them in the back with a new hole. If you flip the bottle outta the cupholder its gonna be a good story! I use a "Convert-A-Ball" for quick easy changes with only one mount. It has a 10,000 lb. GTW rating. In my youth, driving tow truck, this is what we used to be able to move any trailer at a moments notice. I have one similar to this but it was only $80 or so. They have fancy stainless ones that are over $300! I would love to do this type of a mod but it would be rusted in place the first year it would be up there with all the salt on the roads. 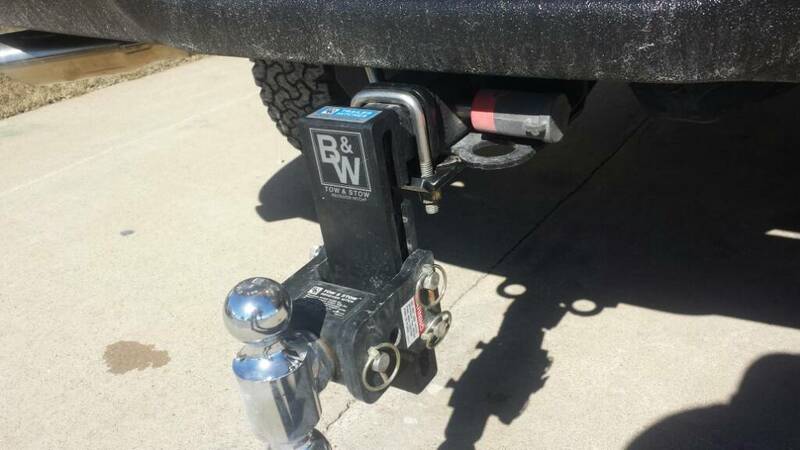 Retired BLM Rig wrote: I use a "Convert-A-Ball" for quick easy changes with only one mount. It has a 10,000 lb. GTW rating. I used one of these on my mini van years ago. After the first two years, the rubber seals must have gotten sliced and it would take a few minutes to switch the balls. I swap tongues in about 10 seconds. And the convert-a-ball isn't rated high enough for my PowerWagon and trailer. Swapping tounges is easier than swapping balls eh? Colibri wrote: Swapping tounges is easier than swapping balls eh? Don't get me wrong, I do like the new adjustable hitch inserts (as shown above), unfortunately they weren't available 25 years ago when I bought mine. I do like the new ones with the built in tongue weight scale, I may need to upgrade.